Is the historian a frustrated novelist and/or the novelist a frustrated historian—to echo quips and claims attributed to H. L. Mencken and Leo Tolstoy? Isn’t a novelist by definition a historian? Must the historian novelist be a historical novelist? Eden Rise is the first work of fiction for Robert J. Norrell, a respected, well-published university professor whose scholarly specialty is United States race relations, including the Civil Rights Movement. As academic historian turned novelist, Norrell (born in 1952 in north Alabama) is not unusual in making a key research area the setting of his fiction. He is more unusual by focusing, in both kinds of writing, on a historical period situated in his lifetime. For him, those particular years, are not ones he experienced as an adult, and the distinctive state region in which he sets his novel is not where Norrell had youthful personal residence. These two facts, of course, have to do with culture and are not without some literary consequences. Initially, the bare essentials of Norrell’s story: Tom McKee is the son of a prominent white family from the small Black Belt town of Eden Rise in west-central Alabama, who in May of 1965 has just finished his freshman year at Duke University. Giving a ride to two black Duke students going to Alabama to work at a summer Freedom School, he gets involved in a deadly racial shooting in his home state. Tom’s friend Jackie Herndon from Duke is killed, and Tom wounds the assailant, a man named Buford Kyle. Subsequent trials convict neither Kyle nor the young McKee. Narrated throughout by Tom, the novel focuses on “the awful summer I was nineteen, when the world seemed to cave in on me," when Tom’s “guilt and the accompanying depression . . . for the death of [my friend] . . . and the destruction of my father’s world” were spawned. Tom thinks: “ . . . in a place devoid of any notion of justice. Poor Jackie. Dead, gone . . . ”; “Daddy’s health and future lay around him like the ruins of a tornado." Included as well, though, are a short prologue, interludes, and postlude set in 1993 and 1994, as Tom decides to testify in a new trial that convicts the elderly Kyle of civil rights violation. Set in Alabama during a recent, widely known period of American history, Eden Rise is, of course, intended as a realistic novel. “Solidity of specification” it has in great abundance. Cheese is not just cheese but Velveeta. The beer is Budweiser, the cigarettes Pall Mall, loose tobacco Prince Albert, the gasoline Esso, the car a Ford Galaxie, the canned corn Del Monte, the pork and beans Van Camp’s, the soft drinks Dr Pepper and Pepsi. Popular television shows of the time are cited by name, and songs and singers heard on the radio are specific, historically accurate, and numerous. Real Alabama politicians and other public figures of the time are mentioned by name or more vitally utilized in the plot (can you say George Wallace?). The mixture of fact and imagination for the geography of the novel is epitomized, if not exactly proportionally, in the four-county area given for a state judicial circuit—Ruffin, Yancey, Dallas, and Lowndes. The last two names are of two actual Alabama counties; the first two are not. Most of the story’s geography, in fact, corresponds or tallies with an official Alabama highway map. Although no town of Eden Rise is to be found on such a map, its location can be coordinately, firmly fixed about where Cedarville is, in Hale County. Inspiration for the town name would seem to be Prairieville or, more likely, Prairie Eden, which are, or were, designations of actual little communities or rural locales not far away. The description of Prairie Eden as a county-seat town in the novel could rest on any number of real models, with several nearby west-central Alabama Black Belt towns as concrete composite possibilities. Eden Rise’s “world of appearance,” however, has unsettling chinks for individuals deeply familiar with this area’s society and culture in the mid-twentieth century. The McKee family’s immediately bringing in an outside bodyguard to protect Tom from his now viciously racist friends, acquaintances, and neighbors is itself hardly credible. And Marvin Whitfield is not just a “hired gun.” He is African American. He is from Chicago. He is a killer and ex-convict whose past employers include the Black Muslims and the Mafia. He will live in the white McKee’s family’s home with Tom, his parents, and his attractive teenaged sister. That the whole arrangement is effected by Tom’s beloved McKee grandmother, venerated family matriarch and inspiring moral exemplum, little alleviates the overwhelming incredulity. Nor is this disbelief diminished by the later, though not surprising, revelation that Marvin is by blood and miscegenation young Tom’s first cousin once removed. Dissonances less central to advancing the action of the story are also encountered. The picture of Buford Kyle primed for violence inside his old country store is pure, extreme stereotype. “The heavyset white man at the cash register . . . wore faded bib overalls, a stained tee shirt, and a straw hat. His potbelly made inoperable the waist buttons on the overalls, exposing dingy boxer shorts. Three days of white beard covered his face, and a large plug of tobacco distended his left cheek." But this supreme racist redneck, his shotgun close by for protective, preemptive—and ultimately homicidal—use at his dilapidated, neglected, dirty little store, is also the sensitive aesthete whose weapon has been made “the object of loving kindness”: “It gleamed, its pewter-colored barrels bearing just the right sheen and odor from the recent caress of a chamois cloth lightly coated with gun oil, its cherry stock waxed and buffed." Here in fact is another stereotype, rooted in Tom’s own higher social class experience among the landed gentry, the company of sportsman quail hunters with the money and cast of mind “to admire the beauty of shotguns." Not only, then, are facile stereotypes employed, but incongruously coalesced—a double kick to experientially informed readers. Collisions between the fictional world a writer offers and the real world as remembered or perceived may be great or small, the felt incongruity still unsettling. A quick gesture or coincidental assertion of fact can abruptly obstruct a reader and rend the veil of reality the novelist is trying to create. One such moment in Eden Rise occurs when a “colored cook” leans over and playfully kisses “the bald head” of an old white male friend of her employer. (The white male, attorney Joe Black Peel, is the most interesting and intriguing character in the novel.) Another such moment is the reporting in casual dialogue that a single Black Belt family farm in 1965 plants three thousand acres of cotton as well as two thousand acres of soybeans. Transgression of the limits of realism, including gross stereotype and exaggeration, might be feared or expected in the multiple courtroom scenes and lawyerly pretrial machinations in the novel. Drama, exaggeration, machination, and absurdity are such realities in these realms, however—nowhere more historically believable than in the segregated South—that credence rides the sad crest of this mimetic test with relative ease. Obviously, then, novelists work in a minefield. Their successful achievements versus their slips in such challenging territory need to be weighed, acknowledged, and admired. Another kind of observation, ironic if not oxymoronic, should be made in this regard, however. It is true that truth is stranger than fiction. Unless it is science fiction or fantasy fiction—and maybe even in these types—successful, lasting fiction cannot be also too strange. As a rule, enduring fiction shows the probable rather than the simply possible, the typical or likely more than the atypical or unlikely. 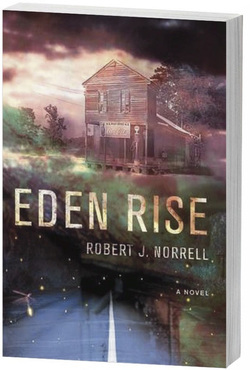 Readers of Eden Rise without close, lifelong personal knowledge of twentieth-century Alabama Black Belt culture—and this will be a majority—probably will not register terribly impairing disconnections between actual and fictional “worlds.” Many will become engrossed in the story, be moved emotionally, have their moral principles gratifyingly confirmed, and feel substantially informed about a watershed time and place in U. S. history. Norrell’s debut novel is thus certainly worth having in the long, impressive list of Alabama works of fiction about the Civil Rights Movement. This work, though, will not displace the more accomplished literary fiction in this group—Madison Jones’s A Cry of Absence, for example. One key reason is encapsulated in the book’s last, two-sentence paragraph. “To be sure,” says Tom McKee finally, “the past is never over. But something has made it easier to find the place inside me where hope resides.” Aspiring fiction writers are advised to show, not tell—surety asserted is more questionable than it is convincing. Here, now, after having completed the novel, can any reader say what this “something” is? A recent “Briefly Noted” book review in The New Yorker posits one of “fiction’s most basic pleasures” as “the inquiry into why people behave as they do.” We feel such inquiry for some Eden Rise characters, but for others, including the novel’s protagonist, it is not very discernible or satisfying. Eden Rise. By Robert J. Norrell. NewSouth Books, 2012.